You know our friend and Barbecue Board member Rob Baas. 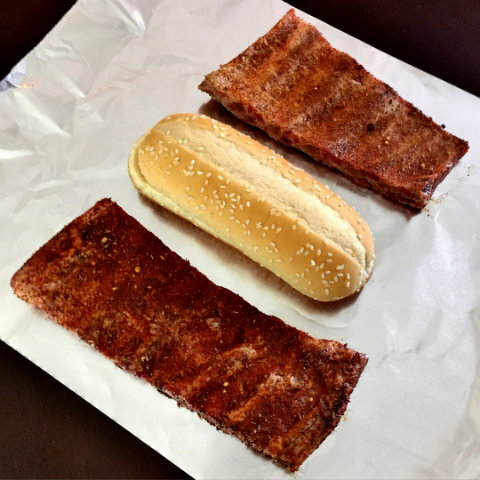 A few weeks ago the Project Smoke fire wrangler, BBQ U alum, and all around master of live fire cooking had the idea to reimagine the fast food McRib as real barbecue. Challenge met and expectations surpassed. 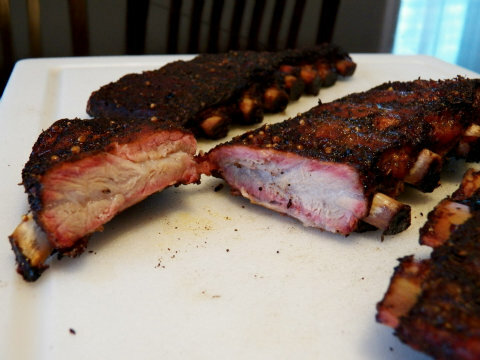 This is one guest blog I can’t wait to try out on my smoker. Like so many other American high school kids who needed gas money, my first job was at the local McDonald’s. Had the McRib been on the local menu back then, I might be working there still. 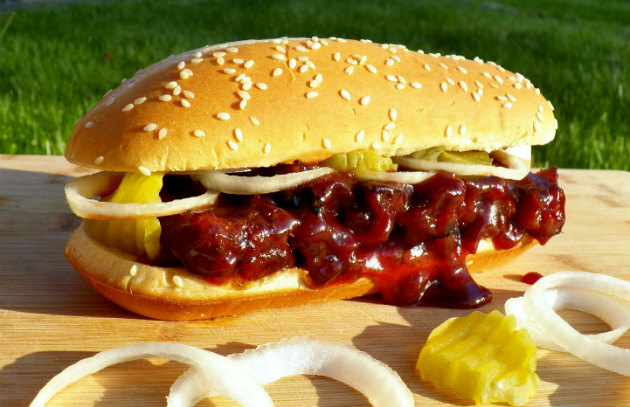 If ever there was a fast food item with a cult following, it is the McRib. It doesn’t really make any sense, although scarcity and nostalgia probably play big parts. I might go a year or two without visiting any McDonald’s anywhere, but when the “McRIB IS BACK” sign grabs my attention I’ll pull the e-brake and slide backwards into the drive-thru line if need be. 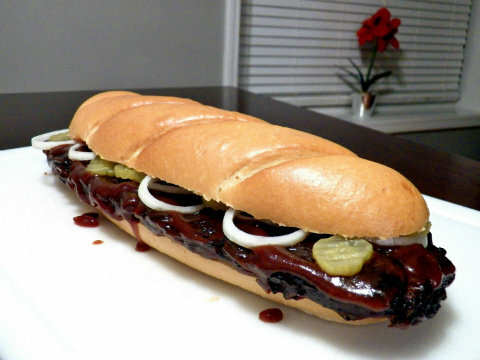 The McRib in one word: messy. The mystery meat is slathered in so much sauce that it’s hard to keep everything between the lines and even harder to keep everything off your shirt. Somehow it works. The sweet and tangy sauce reminds one of backyard BBQ fare so overly sauced that sauce is all you taste. The contrasting crunch of sliced onions and pickles adds a welcome touch of reality. The weak link is the meat patty, which is somehow colorless and tasteless at the same time. The only redeeming quality is its shape that resembles a cute little rack of ribs. I’m fortunate to have a Farmers Market that is stocked with local producers of top-notch meat. Our beef farmer is the one who named this sandwich The McRob. So, how do we turn these ribs into a sandwich patty without the bones? Overcook them! 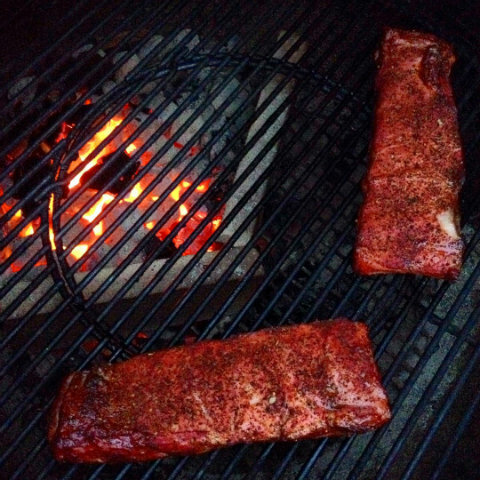 We’ll smoke them, and then we’ll experiment with ways to keep cooking them until the ribs slip out. The plan is to smoke the ribs for a couple hours and then cook ’em in a steam pan with some liquid stuff and some sweet stuff until they’re fall-off-the-bone tender. Once they’re in the pan it doesn’t matter how you cook them, but we want to stay in the 225-250 temperature range for the whole process. We’re not being picky about rubs or sauce yet—here we used Rendezvous seasoning and a homemade BBQ sauce. NOTE: It is absolutely crucial that we remove the membrane from the back of the ribs before smoking. Otherwise, the bones aren’t going to fall or slide out. Before going on the grill, the rib cuts seem perfectly sized (just a tad over-sized) for the Philly steak rolls. Stoney Creek Ribs on the Weber Kettle. Indirect heat with hickory smoke. It worked better than expected. When the bones are ready to slip out, we have the perfect sandwich patty. One that deserves a BBQ sauce bath before meeting the bread, the pickles, and the onions. This could be the best sandwich we’ve ever made at home. The onions and peppers added a little flavor, and—like the first method—it was easy enough to periodically check the ribs to see when the meat was ready to leave the bone behind. These sandwich patties were not very uniform in size, so the small one went on a hamburger bun with some mustard greens and grilled onions and peppers. We don’t talk about Take IIIA. 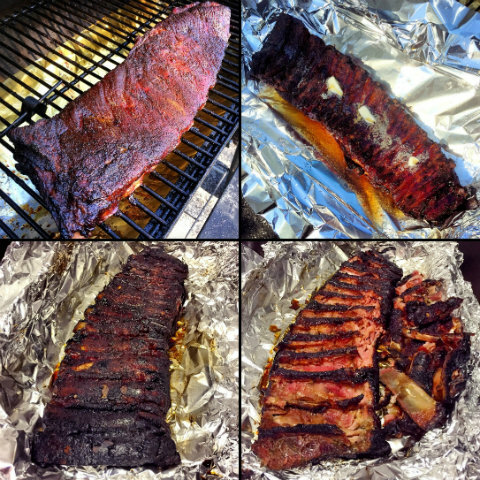 This time we tried cooking the ribs in foil for a few hours after smoking. 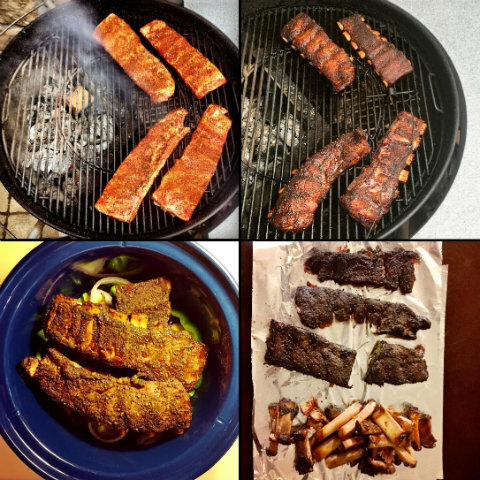 The popular 3-2-1 method for spare ribs translated into a 2-2-0 plan for these small cuts—two hours in the smoke followed by two hours in the foil and that’s that. NOTE: Since we’re not talking about Take IIIA anymore, it’s worth remembering that we always remove the membrane from the back of the ribs. I don’t usually wrap BBQ ribs when smoking them. But when I do, I like to lay them upside down on a strip of brown sugar before adding pats of real butter and a strip of honey on top (the bone side). Before closing the foil I also add some beer or apple juice. This works great for our sandwich purposes, and cooking them this way has the added bonus of making it easier to pull the bones out when they are unwrapped because the ribs are already bone-side up. These patties were pretty small, so here’s to the first Double McRob. 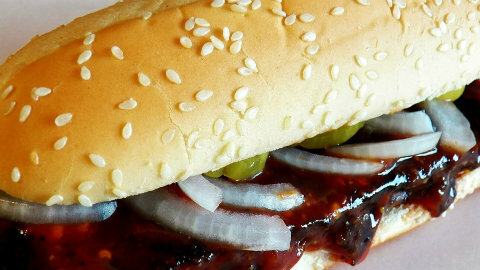 As far as flavor goes this one was probably the closest to the McRib because we used Sweet Baby Ray’s for sauce. Cheers. 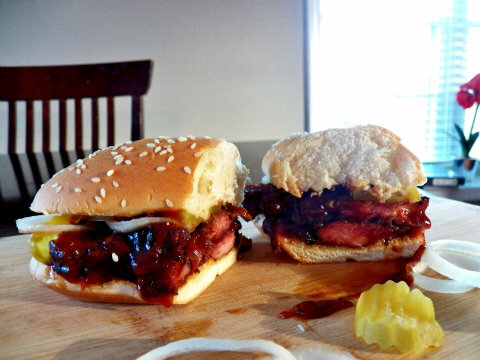 We can definitely make a better rib sandwich at home than we can purchase in a drive-thru. 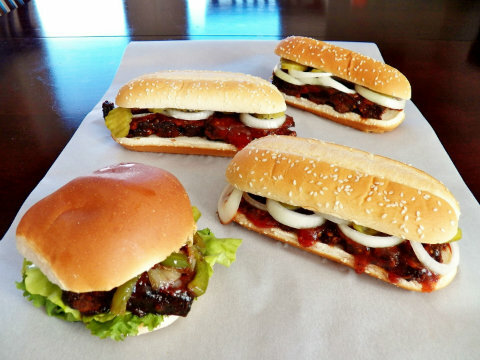 Sandwiches that feature real rib patties full of smokey goodness that are shaped like ribs because they are ribs. We can mimic the original formula (which is pretty darn good), or we can use the bread of our choice, the sauce of our choice, and the toppings of our choice. The first method we tried seemed to work best, but all three delivered. What if we don’t have access to small rib cuts, such as the ones from Stoney Creek? If the concept works for small rib cuts, it should work for a full rack of ribs, right? 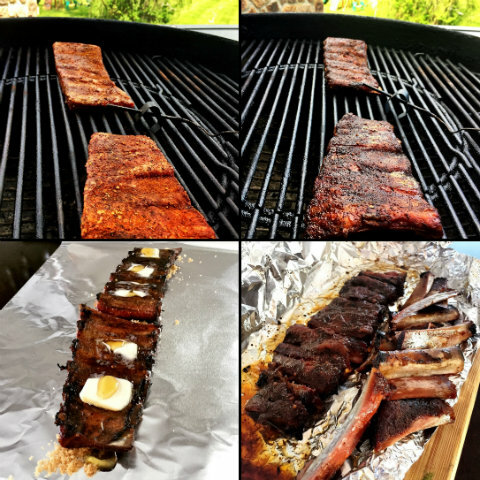 We experimented with a rack of St. Louis-style ribs using Steven Raichlen’s All-Purpose Barbecue Rub, and of course we removed the membrane before applying the rub. And this time I added another step. After removing the membrane I cut a slit down each side of the rib bones, hoping that would help them separate from the meat after cooking. It worked. 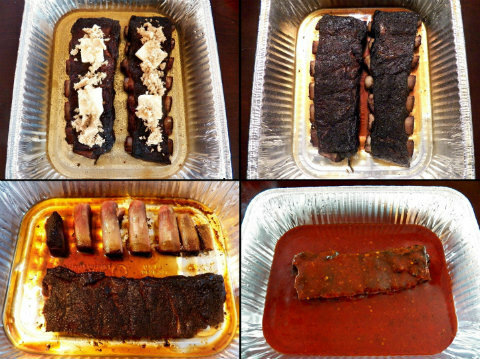 1) The ribs had a great color when they passed the bend test. 2) They were wrapped upside down with brown sugar, butter, honey, and beer. 3) Overcooked, super-tender ribs after 2 1/2 hours wrapped. 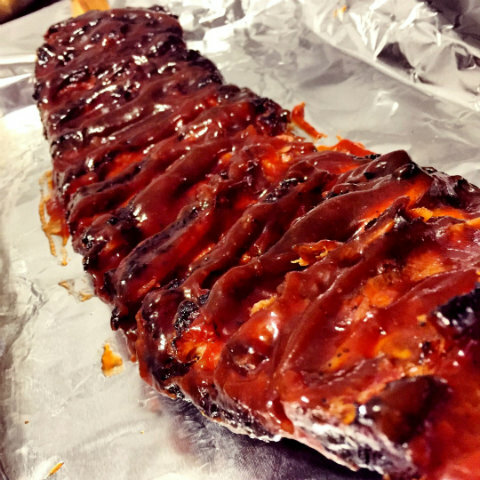 4) The full rack of boneless ribs. Normally we would eat the ribs when the bend test says they are ready, but we’re trying to overcook them so they were just getting started after Step 1. After four hours of smoke and another 2.5 hours of cooking while wrapped, the meat was very tender. Most of the bones pulled right out along the cuts we made before cooking, but some took a little work with a small knife. After about eight minutes all the bones were out and we had one full-size rib patty ready for the biggest legit McRib-style sandwich ever. A large loaf of French bread from the grocery store bakery was a perfect fit! We sauced the bottom of the ribs first and put the bottom bun on before flipping the whole thing over onto a cutting board. Then more Sweet Baby Ray’s for the top before the onions and pickles. And here it is. 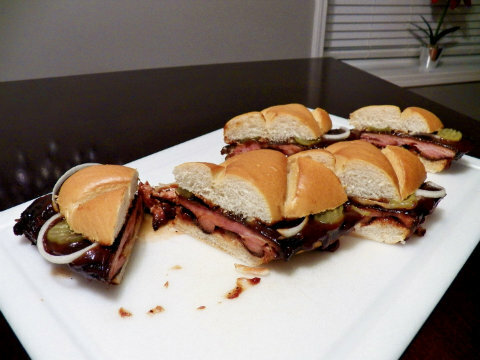 A whole rack of real smoked ribs turned into the biggest and most authentic McRib-style sandwich we’ve ever seen. Or tasted. McRob v4.0. St. Louis-style. Mind. Blown.